If you lived in Arizona anytime from territorial times to 1992, you would have known Valley National Bank. It had been around so long that it had been deeply tied into the financial success of Arizona itself. So when it started tottering, in the mid 1980s, a crisis was looming that was averted when it was bought out by Bank One. I got to see it happen, working in the Marketing Department for Valley Bank, as a graphic designer. In fact, I had just barely started, in 1990, when the people around me started telling me how precarious a position Valley Bank was in. My favorite comment at the time was someone saying that if Valley Bank went under, we would all have to leave Arizona, and the last person turn out the light. I didn't understand how all of it worked, and I still don't, but it was a great job that I wanted to keep, and all I could do was hope for the best. And it worked out great for me. When I started at Valley Bank, I really didn't fit in very well. I came from a corporate background in Los Angeles, and was one of those typical young "whipper-snappers" with a college degree who hadn't grown up in Arizona, and didn't know how "things were done". It was very confusing to me, but I kept smiling. To me, Valley Bank seemed to be run as if it were a bunch of people who couldn't quite agree on anything, and whatever rules there were in the graphics department were based on what seemed to be whims, and egos. I asked for corporate guidelines, which I had learned to rely on at my previous job, and no one seemed to have any idea what I was talking about. My past experience had been with Blue Cross of California, and we had a manual that told us what colors to use, what fonts, how the logo should appear, etc. Valley Bank had none of that. In fact, when I started it didn't even have a logo. Before I started, Valley Bank had used the old "stop sign" logo. In fact, they had used it since the 1940s, and many of the people who had been with the bank for a long time wanted to use it. But I was told "no". 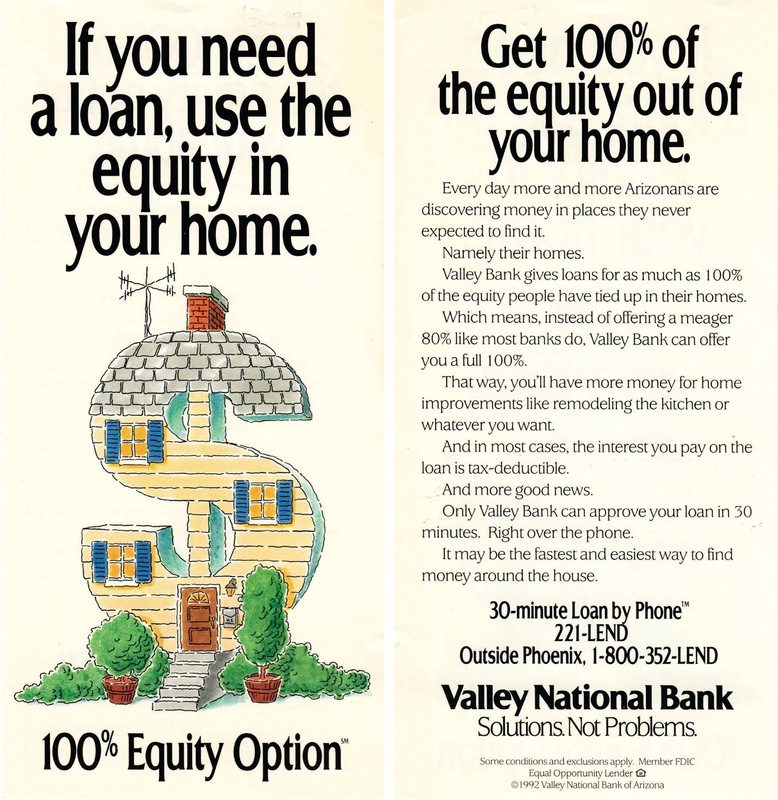 The "logo" that we used at the time, which you can see in the ad at the top of this post, was simply lettering "Valley National Bank" with the slogan. And the look of the slogan would change depending on which department we did the work for. Advertising used "Solutions. Not Problems", elsewhere it was "Solutions. Not problems". And there were lots of little things like that, which to me were indicative of a business that behaved more like a small business than a big one. For many people who worked there, that was a positive thing, but for me it wasn't. I was a corporate designer. By the way, the new VNB logo (I wish I had a copy of it to show you!) had been in the works for years, and would have been revealed the same year that Bank One bought Valley Bank, but of course it wasn't needed. When Bank One took over, everything went corporate. I was happy to get a real corporate manual with specific guidelines that I could follow for design. And there was a real logo! In the new environment I flourished. I was promoted, but sadly many people who couldn't adapt to the new situation had to go away. The very last day of Valley National Bank, at least for the graphics department, was on a Friday. I don't recall exact what day, but the goal was that on a particular Saturday, when people walked into a branch, everything would be updated to be Bank One. Every brochure, every sign, every deposit slip. Thousands of details had to be done perfectly. We did it. 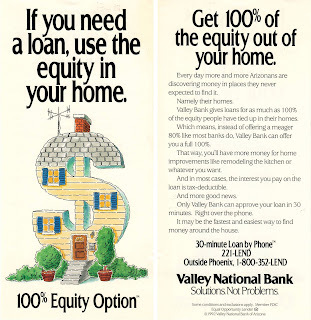 Image at the top of this post: One of the very last ads for Valley National Bank, 1992. Done by the advertising agency.